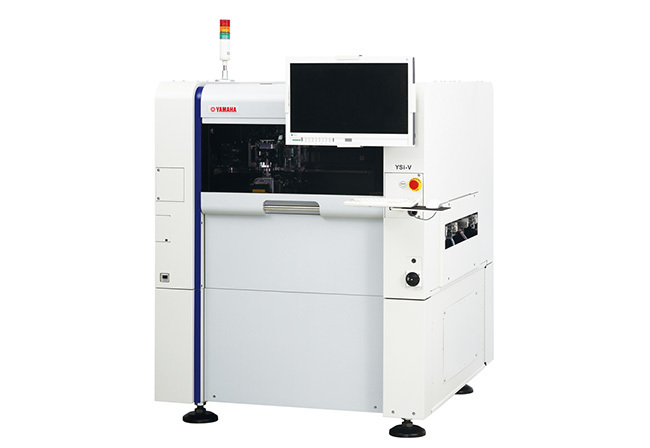 Yamaha Motor Releases New High Speed 3D AOI, YSi-V 12M TypeHS High-end, Hybrid Optical Automated Optical Inspection System with 25% Faster Three-dimensional Inspection Tact - News Releases | Yamaha Motor Co., Ltd.
IWATA, January 7, 2016—Yamaha Motor Co., Ltd. (Tokyo: 7272) announced today that the YSi-V 12M TypeHS high-end, hybrid automated optical inspection system (AOI) will be launched on April 1, 2016. This new model will be based on the YSi-V, which can carry out high-speed, high-resolution two-dimension inspections, height and inclined surface three-dimensional inspections, and four-directional inclined image inspections all in one unit*1, but will feature the addition of a faster three-dimensional inspection option. This new model will bring the total number of YSi-V three-dimension inspection system types available to six, allowing selection of the optimal specification to suit a variety of PCB type production settings. Along with the YSi-V 12M TypeHS featuring enhanced responsiveness for its high-speed projector in joint three-dimensional image capture at the height throughout its field of view, it also has improved image processing capability, and a further 25% speed increase in three-dimensional inspection tact compared to the existing high-speed type, the YSi-V 12M TypeS. In addition, Yamaha Motor has developed the iProDB inspection history management software and will provide it free of charge to customers who use the YSi-V. This software stores and analyzes information generated from the source of rejected items for use regarding design problems and process improvements. The new YSi-V 12M TypeHS will be on display at the 45th INTERNEPCON JAPAN trade show for electronics manufacturing and surface mount technology (SMT) to be held from January 13-15, 2016 at the Tokyo Big Sight (Ariake, Koto-ku, Tokyo). Given that electronic PCB reliability has a direct impact on the market value of final products, in the field of electronic component mounting where the trend to smaller models and higher density is accelerating, in order to ensure the reliability of the PCB, quality inspections of soldered joints and fast yet accurate and precise mounting via automatic inspection are sought after. Especially as the size reduction and density increase of mounted components progresses, an increasing number of customers are seeking inspection by three-dimensional methods as they can detect floating and tilted components. At the same time, three-dimensional inspected components are becoming more common and in demand for SMT production line productivity improvements. The YSi-V 12M TypeHS answers the demand for this type of increased three-dimensional inspection and high-speed inspection needs as it features a 25% speed improvement in inspection tact on existing models, and is an optical external inspection system which promotes the strengthening of all-item in-line inspections in mass production facilities. With the addition of the new TypeHS spec enabling even faster inspection, there is now a total of six types of inspection systems available, allowing selection of the optimal model to suit an even greater variety of PCB type production settings. In the three-dimensional inspection by optical phase shift method adopted in the YSi-V, rapid detection is possible even for cases in which two-dimensional image processing has difficulty, such as where extraction of foreign matter is not possible due to silk and land pattern interference and/or where the colors of the PCB and the components are similar, or where components are floating or tilted. In addition to this, judgments can be made on the quality of the shape as detection is possible of the direction and gradient of the object as well as its height. With the YSi-V 12M TypeHS, focus is placed on this three-dimensional inspection speed, and has enhanced responsiveness for its high-speed projector in four-directional image capture at the height throughout its field of view. The system also features improved image processing capability, and a significant further 25% speed increase in three-dimensional inspection tact on the existing model, the YSi-V 12M TypeS. The newly-developed iProDB inspection history management software is designed to support operations for smooth running and improved quality across the overall SMT production lines taking advantage of Yamaha Motor being a full-line manufacturer of mounting equipment. Enables joint monitoring of the status of all devices, such as surface mounters, printers, and inspection equipment. Inspection results are stored as data and calculations are made based on this data to predict any likely future production issues. Quality improvements are supported through its use in PCB design issues and process improvements.